lukter svidd” (Daddy smells burnt), I started making my own hot dog, burger and slider buns many years ago. This is basically his recipe, and it’s pretty straight-forward. I also use these for any BBQ-based sandwiches (pulled pork for instance). 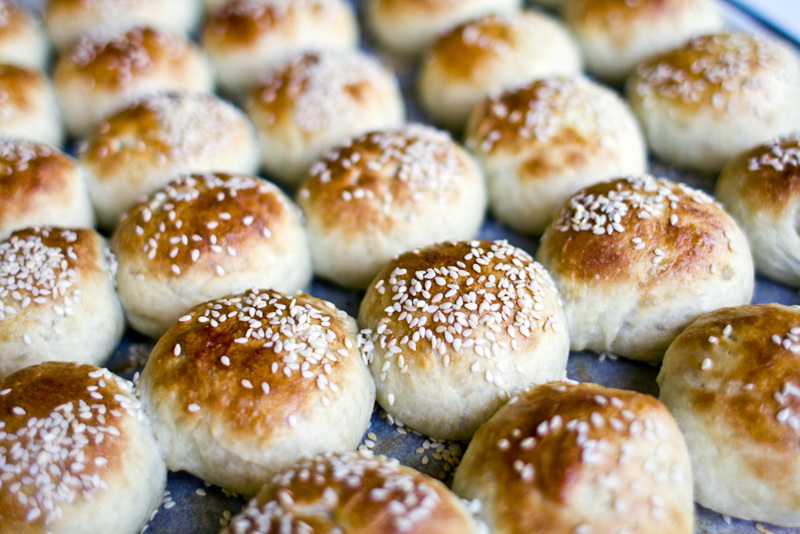 Be warned though – once you try homemade buns like these, you’re NEVER going back to storebought… I usually make a large batch (2-3x this recipe), put them straight in the freezer, they only need 1-2 hours to defrost and taste great. This recipe makes about 60 slider buns, 25 large hot dog buns or 19 burger buns. Put all the dry ingredients in your mixer bowl and whisk them a little. Put milk and water in a microwaveable (!) container, and heat to about body temp (for once I avoided the temp conversion from C to F!). Whisk the two eggs and rapeseed oil thoroughly into the milk/water mixture. Pour water mixture slowly into dry stuff while mixing continuously at low speed. Once the dough starts forming, crank it up, and knead it for 5-10 minutes by machine. You’re all set, leave the dough covered to rise for about 45-60 minutes until it has doubled in size. Now, knead the dough a little by hand to get the large air bubbles out and the small ones evenly distributed. Once that’s done, you can start making your buns. I like to use a scale, so I can get them all the same size. I use 30 grams for slider buns, 75 for large hot dog buns, and 100 grams for large burger buns. Turn your oven to 200 degrees centigrade (390F). Roll out the buns, and then squeeze them pretty flat, about 1,5cm (half inch) thick. They rise quite a lot. Cover the trays of buns with kitchen towels, and leave to rise to double size, again about 45 minutes. Brush them with egg wash (milk+egg white), then sprinkle seeds on top. Bake them in the middle of the oven for 10-14 minutes until golden brown. Transfer to wire rack immediately to let them cool, before eating them or bagging and freezing them. Enjoy! This entry was posted in Baked goods, Sides and tagged baking, bbq, buns, burger buns, cooking, homemade, hot dog buns, onion, sauce, sesame seed, slider buns, vegetarian by bbqviking. Bookmark the permalink.